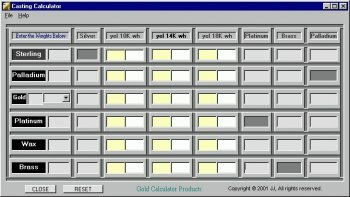 Casting Calculator is an ideal tool for computing and converting precious metals and alloys in lost wax casting. A must for Jewelry Professionals, Manufactures, Hobbyists and Laymen. Just enter the Weight of your mounting or jewelry in the metal or alloy of your choice and it will automatically give you a readout in the output text boxes what the new weight of the mounting will be in the metal or alloy of your choice.